Pet Project - World going to the dogs? Go to the dog park. I am delighted to announce that polite, stimulating conversation is not dead. It is alive and well at the Eau Claire Dog Park. I’m a newbie to this city, having recently moved from the sticks to Eau Claire with my yellow Lab, Penny Lane. Among other adjustments, it was hard getting used to not being able to just open the back door and go for a walkabout with my dog in the woods that surrounded our house or in the corn and alfalfa fields that were across the road. I tried leash walks in my new Putnam Heights neighborhood, but for Penny, I could tell they came nowhere near satisfying her need for exercise; for me, it was just plain boring. Then I heard about the Eau Claire Dog Park. It was great for Penny, who gets along swimmingly with just about any dog or human (more so if they have a treat), and for me, well, watching dogs beats television anytime. But the perk I wasn’t expecting was a social one. There are almost always other owners there, and the usual custom is to fall in with whoever’s traipsing around the perimeter while the pooches chase, wrestle and play keep-away with whatever treasure they can find. Dogs generally sniff and circle each other for a moment and then are apparently friends for life. Human interactions begin easily with a common bond: “What’s your dog’s name?” “What breed is that?” The ice broken, you’re often off into lighthearted, casual exchanges that usually begin with your pet’s history and idiosyncrasies, but soon morph into free-ranging conversations over professions, personal histories, philosophies, local events, politics, the best restaurants, and just about anything else. Yes, perfect strangers actually talk to each other. Interspersed between poop picking (bags and a dumpster provided for your convenience) and reprimands if Cooper, Norton, or Olivia gets a little too enthusiastic, the common bond, the fresh air and the walking facilitate a kind of easy sharing you’ll never find in a coffee shop or on a park bench. Actually, it’s difficult not to socialize, since it’s hard to be absorbed in a cellphone without tripping over a dog and ear buds won’t help you hear a stampeding pack. When your dog is having a rollicking time making new friends, it’s hard not to join in. My dog’s new friends have included other labs (black, yellow, and chocolate) as well as breeds such as golden retriever, German shorthair, greyhound, Great Dane, blue tick hound, poodle (and Labra-doodle, golden-doodle and other-doodle), bulldog, Chihuahua, dachshund, Yorkie, whippet, borzoi, pit bull, blue heeler, Weimaraner, springer and cocker spaniel, malamute, husky, and more, not to mention therapy dogs, hunting dogs, rescue dogs, drug dogs, herding dogs, and three-legged dogs. My unscientific survey indicates the goldens are the most represented purebred, but the majority of dogs seem to be from shelters. Among the humans I have met was a trucker who stops with his two retrievers on each run to Indiana. A Marine just back from Afghanistan talked about studying to become a counselor to help vets with PTSD. A young woman schooled me on the rules and strategies of roller derby. An older woman told me about the 500-mile hike through England she took her son on as a high school graduation present. A local business owner described his struggle with turning over his business to his daughter. 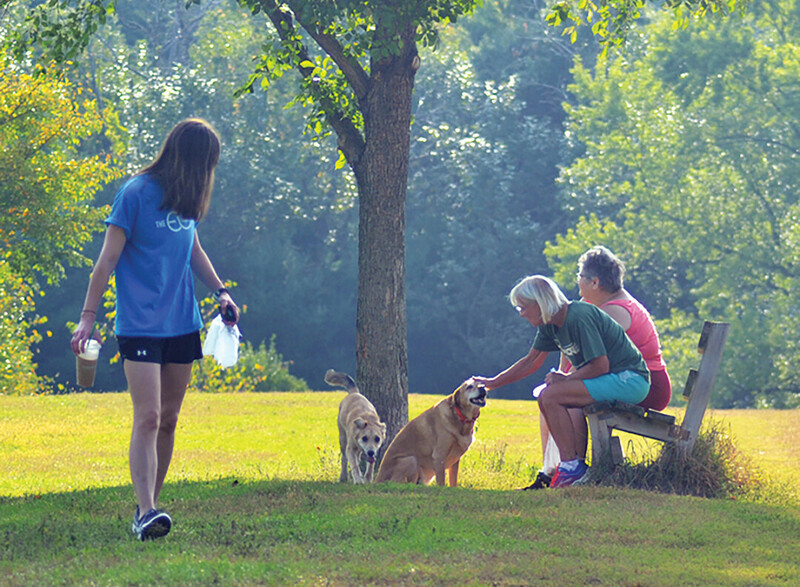 A Blugold coach, a social worker, a cancer survivor, a surgeon, a musician, an accountant, a nurse, college students, teachers, principals, professors, retirees, teenagers, stay-at-home moms, waitpersons, and too many more to remember – all of these dog people I’ve met at the park. As a newcomer to Eau Claire, I can’t imagine a better way of learning what kind of people live here than going to the dog park. True, you only meet dog people there, but they may just be the best kind. Just ask their dogs! More information about the Eau Claire Dog Park (aka the Off-Leash Recreation Area) can be found at www.ci.eau-claire.wi.us/departments/recreation-services/parks/dog-park. A second dog park, on the city’s north side, is also in the works.